What’s in Jax Mariash’s Stage Racing Pack? You are at:Home»Featured»What’s in Jax Mariash’s Stage Racing Pack? Jax Mariash is one of the most accomplished stage racers in the world. 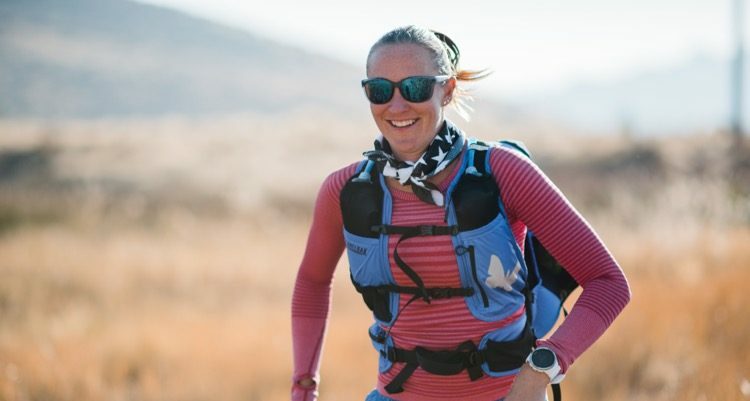 In 2017, she became the first woman to complete the 4 Deserts Race Series Grand Slam Plus – a series that consists of four 155-mile stage races in some of the most inhospitable climates imaginable: the Sahara Desert in Namibia, Gobi Desert in China, Atacama in Chile, and the “Last Desert” in Antarctica. The Grand Slam Plus adds a fifth roving race, which was in Sri Lanka the year Mariash completed the full series. Stage races are challenging not only due to the terrain and climate, but also by external components imposed at each race. Namely, these races are almost entirely self-supported, with competitors responsible for carrying almost everything they will need over the course of a week. Typically the only necessities provided by the event are hot and cold water each morning and night, and a shelter to sleep in. Everything else, from clothes to food to safety and sleeping gear, is up to the runner. 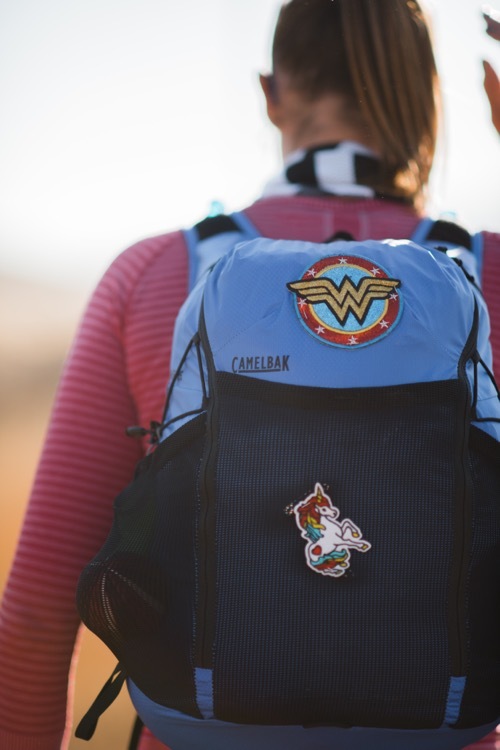 This month Mariash – who often goes by the nickname Wonder Woman – is competing in the Grand to Grand Ultra (G2G), a 170-mile race that starts at the rim of the Grand Canyon and finishes in the Grand Staircase – Escalante region. The G2G features six stages over seven days across Arizona and Utah, with a total ascent of more than 18,000’. 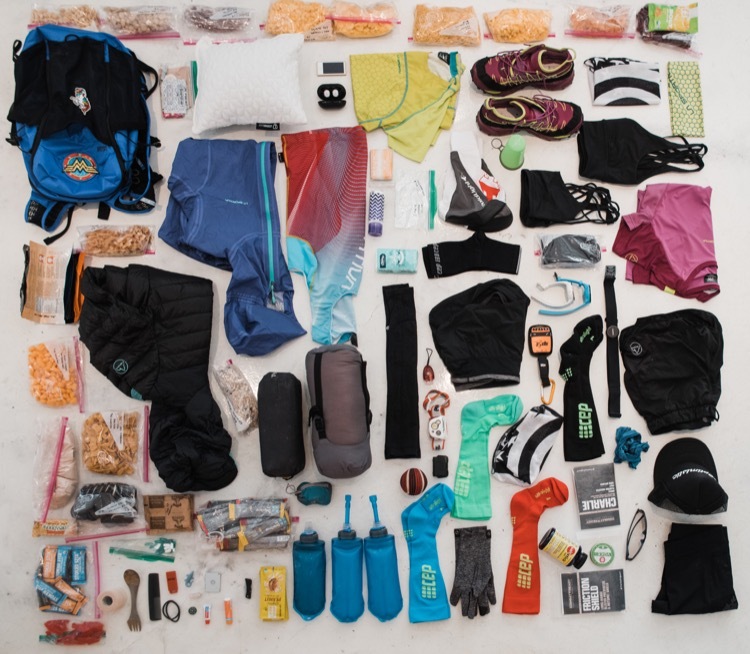 Prior to this year’s race, we spoke with Mariash to learn what she’s carrying with her during G2G, and also to get an appreciation for how much strategy and attention to detail goes into her pre-race preparation. She opened up the entire contents of her pack to us, item by item. 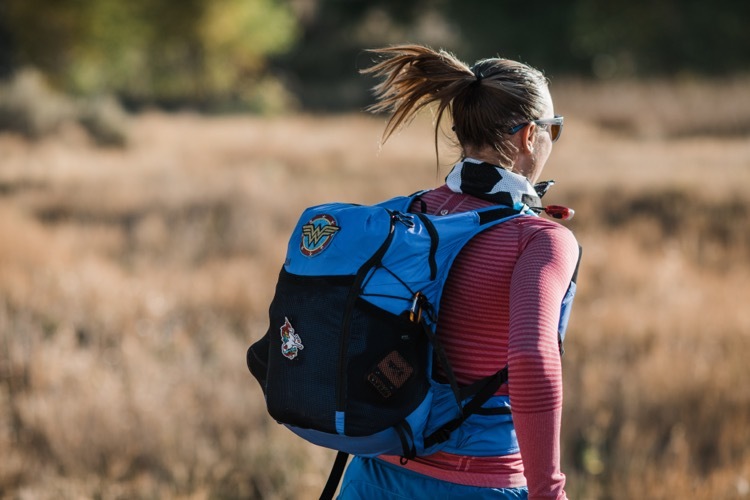 In the interest of full disclosure, many of Jax’s products are from her sponsors: CamelBak, La Sportiva, Suunto, CEP, Zeal Optics, Jaybird Headphones, Expedition Foods, ProBar, SaltStick, Avalon7, DripDrop, and Combat Ready Tape. Additionally, she’s the owner of Stoked Coffee Company, so she’s always armed with good brew. With that said, here’s what she’ll be carrying across the desert this month. The most important item is one Mariash helped design: a 25L prototype of CamelBak’s classic Octane pack. The pack has a 1.5L fluid capacity, carried in flasks on the front. The pack itself weighs about 0.5 kilos (1 lb, 3 oz), and when fully loaded, the entire contents will weigh between 6.5 – 7.5 kilos (14.3-16.5 lbs). The goal here is for maximum caloric density… and many of the items might surprise you. (You’ll note that Mariash has a taste for cheese.) She has every bite of food for every day accounted for, with the weight and number of calories for each. Most of this food is removed from its independent packaging, and combined into lighter and more space-efficient Ziploc bags. She also carries a titanium cup for her coffee, and a spork for anything she can’t eat with her fingers. Some safety equipment is mandatory – with lists that vary slightly from race to race – while others are stowed in an abundance of caution. A few extra grams here could be worth their weight in gold if they can help minimize pain, stop bleeding, or in severe cases, save your life. Stage race packing isn’t 100% strategic – sometimes it’s nice to have a small comfort or piece of encouragement along the way. The following items aren’t necessities, but they can often lift Jax’s spirits when she needs it the most. There’s one final item we thought was sweet: Mariash solicits notes of encouragement from her family and friends in the weeks before a big event, and each day she designates a time to sit down and read a few. This helps her feel connected to those she loves most, and gives her strength to continue on towards her goal. 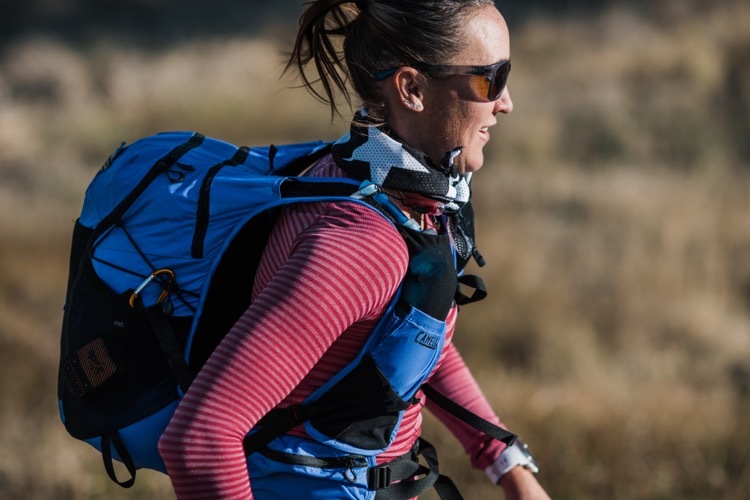 Now that you have the gear secrets revealed, all that’s left is for you to train like Wonder Woman, and you’ll be all set to tackle your first stage race. You can follow Jax’s progress online at www.g2gultra.com.